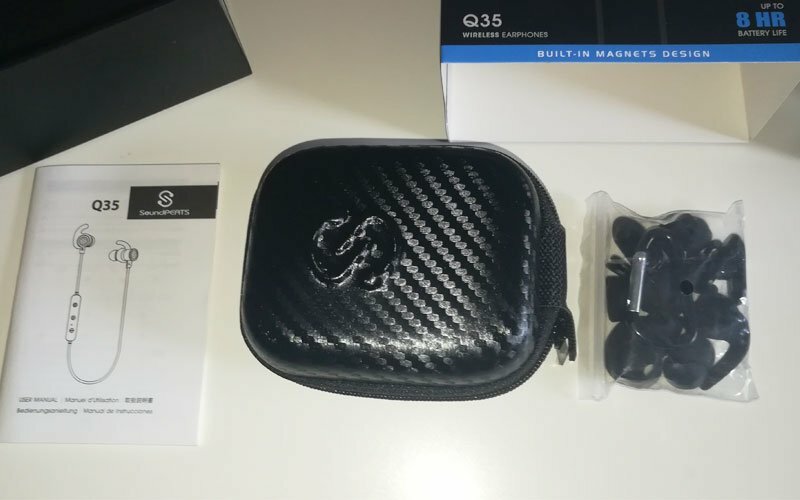 The Soundpeats Q35’s are an excellent highly recommended package that is personally hard to fault. 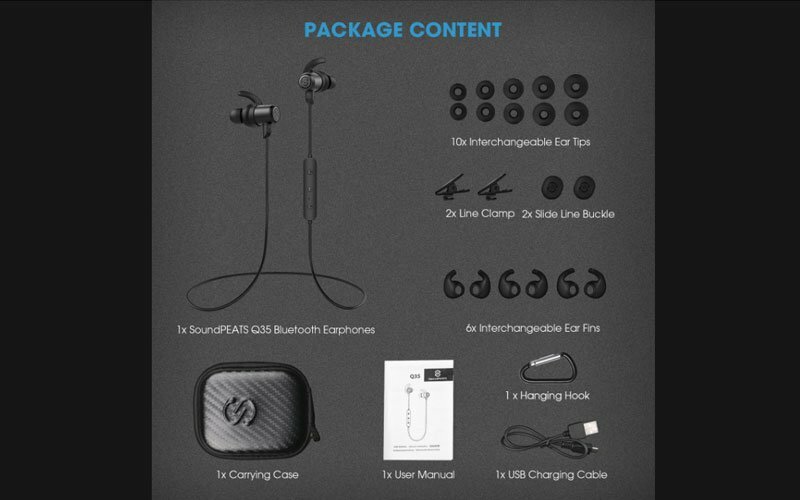 A solid replacement or ideal entry for first time users of Soundpeats earphones, the Q35’s will meet and generally exceed most expectations. Nice mids and highs, balanced sound. Stick out a little when worn. Geared more towards sporty users. 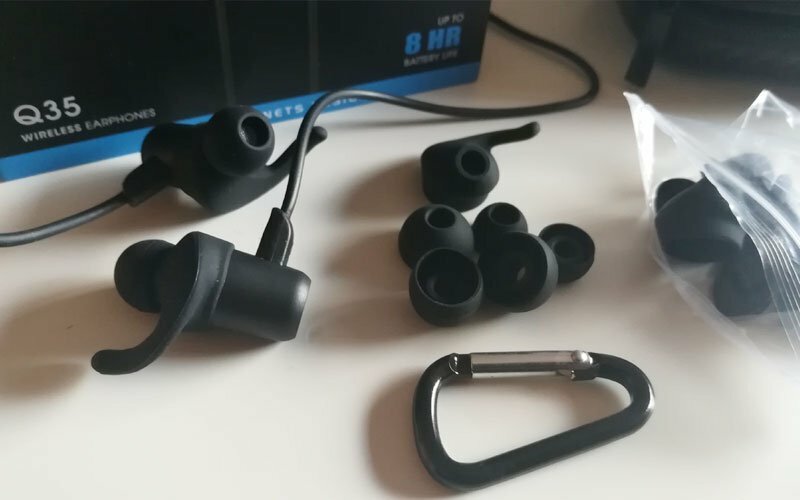 After reviewing and thoroughly enjoying the listening experience provided by the Soundpeats Q30 wireless earphones, you wouldn’t believe my excitement when their sleeker, more refined bigger brother – the Soundpeats Q35’s arrived. Sturdy lightweight design, great sounding and an amazing price with exceptional features – what more could you ask for from a pair of earphones I hear you say. As you can tell by my glee surrounding the previous model expectations were high. To start, all of the features that were found on the Q30’s are here with slight upgrades that Soundpeats fans and new users alike will love. At a glance, the appearance of the Soundpeats Q35’s is impressive – finished in a matt black giving them a subtle but premium look. Small improvements such as a much sturdier built in-line remote, better control buttons that now have a satisfying click to them when pressed and a sensibly positioned charge port that finally seems just right this time all add to the overall user experience. Probably the most important upgrade to note is that the Soundpeats Q35’s now feature a 10mm sound driver instead of 6mm as found in the older model. Bass reproduction is now more balanced than with the Q30’s, which many will find a welcome addition. Although if you’re a baseline junkie the Q30’s deeper bass may be a better option for you. 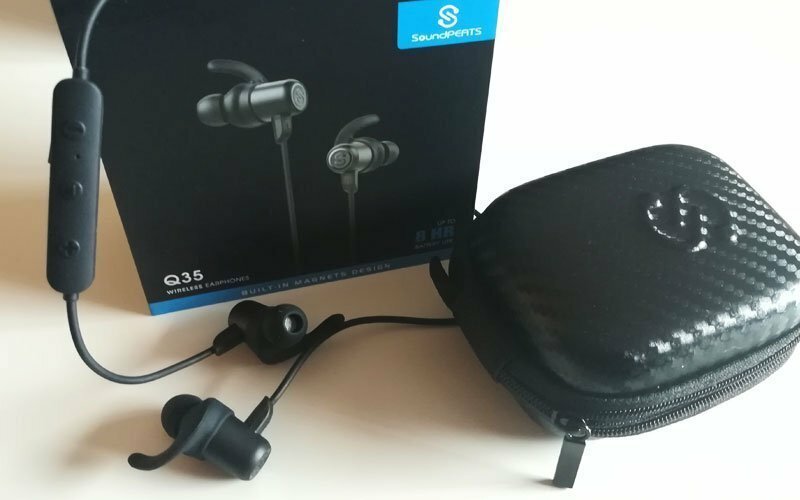 The Soundpeats Q35’s retain their sporty look with an improved IPX6 rating ensuring they are completely dust tight and sealed with the ability to withstand water penetration. Although they are waterproof – this does not mean that the earphones can be submerged in water. Thankfully they will be fine during a hectic sweaty workout or a rainy morning jog. Internal magnets inside each ear bud make a return. Simple but cleaver, snapping together back to back in a necklace fashion making sure you wont lose them and keeping them out of the way when not in use. Size wise the ear buds seem a lot smaller due to their coned shape which overall adds to the sleekness of the Q35’s over the Q30’s. 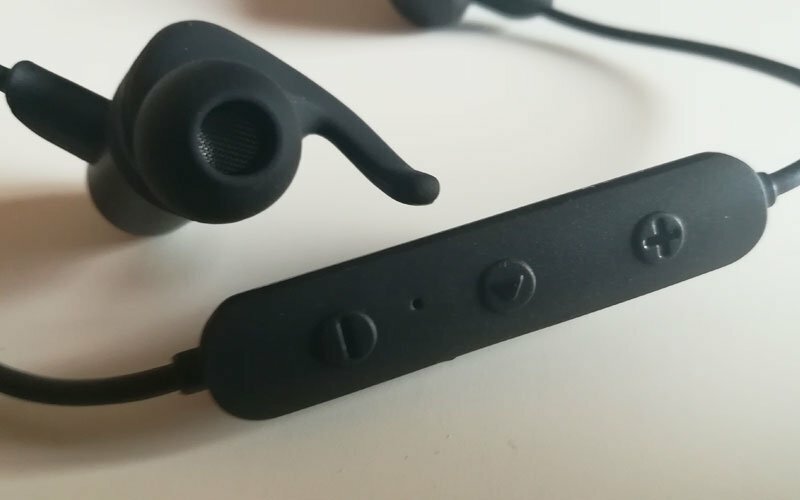 Found just underneath the right ear bud is an in-line remote which houses three multi functioning buttons, microphone for answering/making calls without taking out your phone, an LED power status / connection indicator and a Micro USB charge port with rubberised cover helping to keep the whole unit sweat proof. 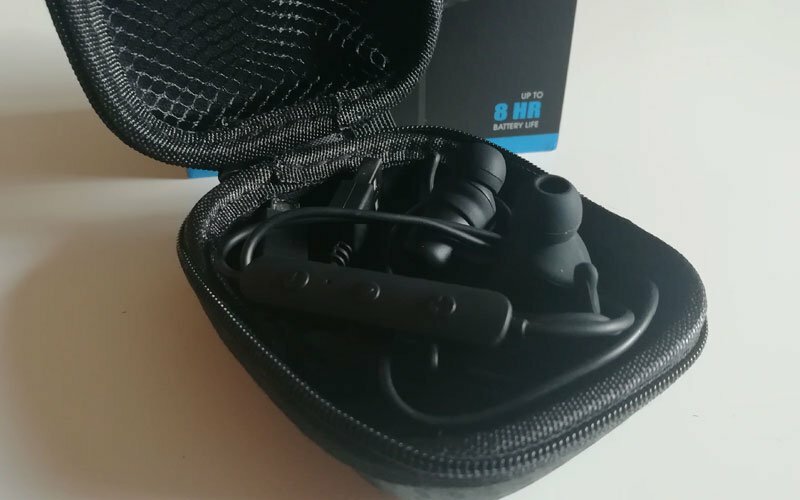 The clever people at Soundpeats managed to provide each ear bud with a 60mAh battery so an overall combined 120mAh of battery power is available, enabling you to listen to music continuously for up to 8 hours according to audio content and volume level. 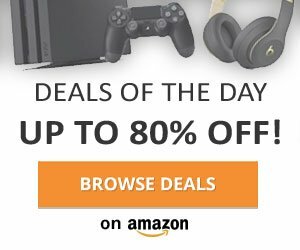 With a standby time of up to 100 hours, these features are extraordinary for a pair of earphones at this price range. Even better, they are fully charged and ready to go after 1-2 hours of charging with the supplied Micro USB cable. Going back to the in-line remote, each of the three buttons has a multiple function whether it is either pressed or held down. For example the volume up button also acts as the skip/next track where as the middle button will play/pause music, answer/end calls and power on/off the headset. Double clicking the middle button will also activate your assistant on your mobile phone – Siri (iOS) or Google Assistant (Android). This button configuration may sound weird at first but honestly you’ll get used to it in no time. 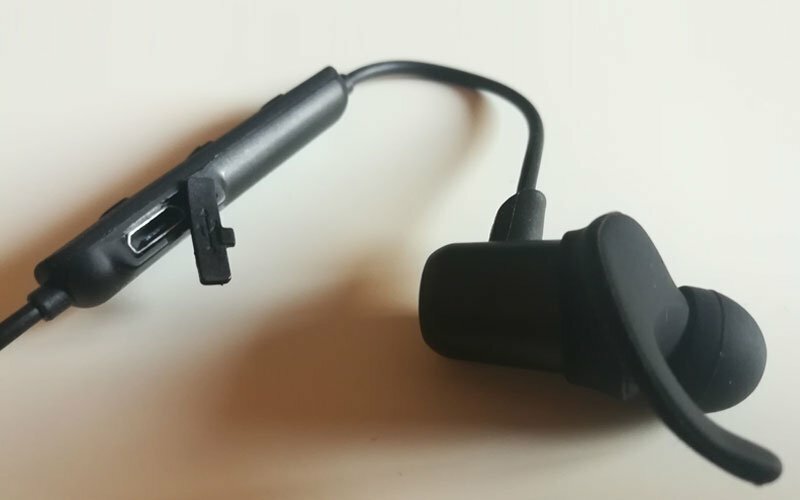 As the Soundpeats Q35’s are compatible with both Android and iOS additional features will vary depending on the mobile or tablet you are connected too. Call quality and mic sensitivity on the Q35’s is great, loud and clear thanks to the built in high quality ECM microphone and CVC6.0 noise cancelling technology. During multiple calls I had no complaints at all with the person on the other end of the line hearing me or vice versa. As the positioning of a mic during a phone call can greatly affect the call quality – I’m happy to say that there were no such issues here even whilst on the move. Whilst the headphones are being worn, you will notice various vocal alerts that will prompt you when powering on/off the Soundpeats Q35’s, when your Bluetooth connection is connected or lost and probably most importantly when battery levels are low. This facility is extremely useful to keep you in the loop with what’s going on without having to check your phone. Pairing the Soundpeats Q35’s to your phone or tablet is easily done by holding down the middle multi function button for about 6 seconds when the headphones are off, they will power on and be in pairing mode. The LED on the in-line remote will flash blue until paired. Once paired, the LED will become a solid blue with a voice prompt over the headset to confirm this. Remaining battery life of the Q35’s will be displayed next to the Bluetooth icon on your mobile phone when connected. The generous customisable accessory pack makes a welcome return this time with a cool carbon fibre look, zip close clam-shell carry case and a metal “D” hook which you can use to attach the case to your bag, clothing or other unique place you can think of. Rubber ear tips (10 in total) ranging from XS-XL are also supplied to make sure you get a perfect in-ear fit, along with 6 interchangeable ear fins that fit in the grooves of your ear making sure the Q35’s stay put during vigorous activities. Additional cable clamps and cable buckles are also provided to fine tune your wearing experience making it as comfortable as possible. Soundpeats have thought of everything! In closing, features found within the Soundpeats Q35’s are quite impressive considering the price, you’ll be hard pressed to find better. As for improvements over the older model, the overall build quality and upgraded sound drivers are a step in the right direction for Soundpeats, with the larger sound drivers in the Q35’s delivering nice mids and highs giving you a more balanced listening experience.